Hi all. I generally don't like to show my work station (ahhhh my kitchen studio) but I have been encouraged by all of you so I guess I will share my gourdy mess today. Yesterday I spent painting up penguin gourds, the hats and flippers and ties were made (with air dry clay) last night and they are all good to go for some paint today. And I base coated all my snowies and they are getting faces, coats and little things done today. I cannot believe today is Thursday, where has this week gone? This will be my last show so then I have orders to complete (I also worked on one yesterday between paint coats drying) and I have the others to get done after the show, cards to make, gifts to buy and well you got it, busy busy busy, but that is how I like it. We did get a tad of snow the other day and some of it is remaining on the ground but you can still see grass. Maybe that will bring the crowds out on Saturday for some great Christmas shoppers. As you know I love making gifts so when I get a handmade ornament or gift I really love it. I appreciate the time and effort one has taken into making it especially if someone knows what I like. I really take pride when a customer buys something I have made, I imagine it on a tree or shelf depending on what it is, and, it makes me smile. Anyways off to paint some more and get my soon expired library books back and get some new ones. One more thing, Happy Thanksgiving to all my US friends. I hope you have a wonderful holiday and I know some of you will be getting lots of shopping done during your great Black Friday deals. 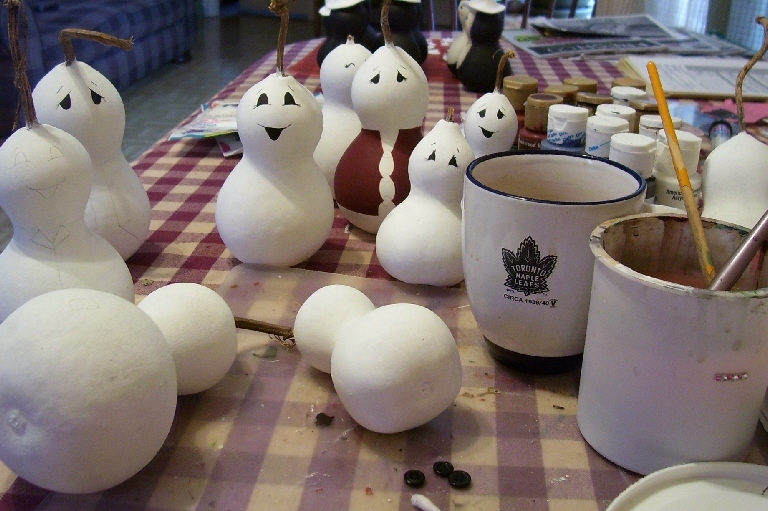 I guess my pics of my gourds in progress did not show up. I was so busy I didn't check my post. 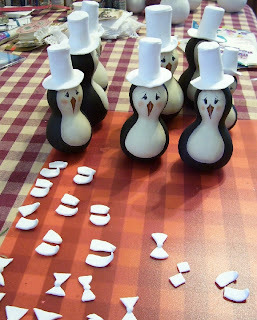 Anyways this has been edited to show the production line in progress. More pics of the completed gourdy folk, show report etc to follow.